Amiri, P., Arabian, D. (2016). The Effect of Reactor Configuration and Performance on Biodiesel Production from Vegetable Oil. Journal of Applied Biotechnology Reports, 3(2), 403-411. Peyvand Amiri; Daryush Arabian. "The Effect of Reactor Configuration and Performance on Biodiesel Production from Vegetable Oil". 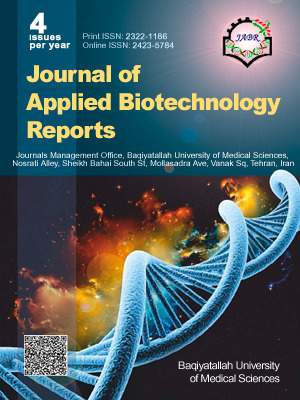 Journal of Applied Biotechnology Reports, 3, 2, 2016, 403-411. Amiri, P., Arabian, D. (2016). 'The Effect of Reactor Configuration and Performance on Biodiesel Production from Vegetable Oil', Journal of Applied Biotechnology Reports, 3(2), pp. 403-411. Amiri, P., Arabian, D. The Effect of Reactor Configuration and Performance on Biodiesel Production from Vegetable Oil. Journal of Applied Biotechnology Reports, 2016; 3(2): 403-411. In this paper, to express the effect of reactor performance and configuration of biodiesel production on subsequent process parameters (including mass & energy consumption, required facilities, etc.) two diverse biodiesel production processes (from plant oil) were designed with using Aspen HYSYS V7.2 software. Two series of reactors were taken into account in these designs, where in the first and second processes, the overall conversion were set to be 97.7% and 70% respectively. Comparative analysis of the results showed that, in the second design, further amount of 10% oil and 28.16% methanol were obtained. In addition, cold and hot utilities were increased to almost 204.48% and 151.74% respectively, while a few numbers of facilities like distillation tower and heat exchangers amended merely. To reduce mass & energy consumption, mass/thermal integration method was employed. In the mass integration, the optimum operation condition and the reduction of material loss were the major points of focus; while in thermal integration, pinch technology were used for exchanger network design. Moreover , integration method showed that in the first design, material, cold and hot utilities were decreased by 49.81%, 17.46% and 36.17%, respectively; while in the second design, oil, methanol, cold energy and hot utilities were decreased by 9%, 60.57% 19.62% and 36.58%, respectively.